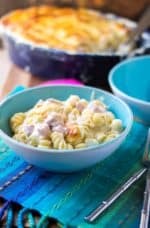 Baked Macaroni and Cheese with Ham is the ultimate mixture of tender pasta in a sharp white cheddar cheese sauce with hearty chunks of ham. Comfort food at it’s best, this Baked Macaroni and Cheese with Ham recipe will be your favorite 30 minute meal to treat yourself to. Favorite food in the whole Universe.. and GO!! Mine hands down is macaroni and cheese. I will admit to having a secret love for the processed, neon orange stuff but homemade Baked Macaroni and Cheese with Ham is where it’s at. Al dente pasta, a decadent rich white cheddar sauce and big chunks of ham makes THIS GIRL happy, happy, happy. 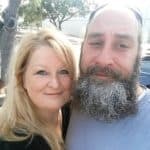 Unfortunately, due to the fact that good macaroni and cheese is anything but figure friendly, I have had to tame my love affair to just special occasions and really bad days… both, however, are subject to a real or imagined status. Zombie Apocalypse? Mac n cheese for dinner!! Dropped my keys on the ground and I had to brush dirt off them? Mac n cheese to turn that bad day around! It’s all very subjective when it comes to this dish. 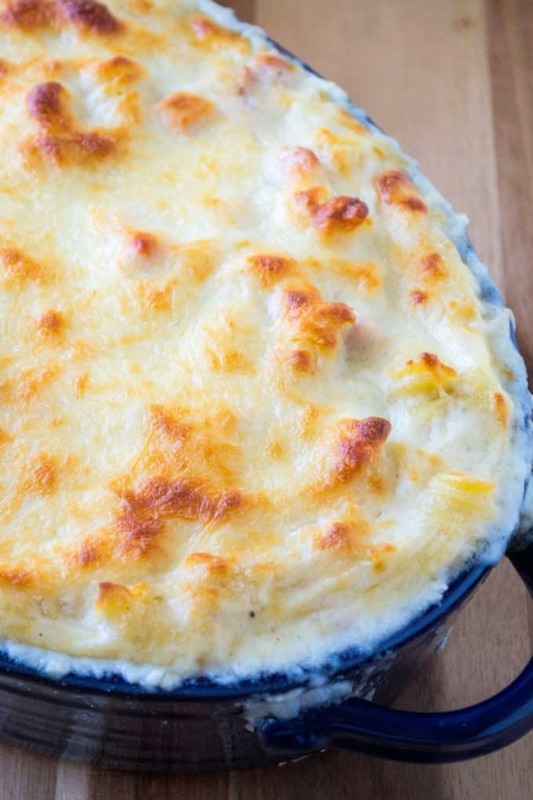 HOW DO YOU TOP BAKED MACARONI AND CHEESE WITH HAM? 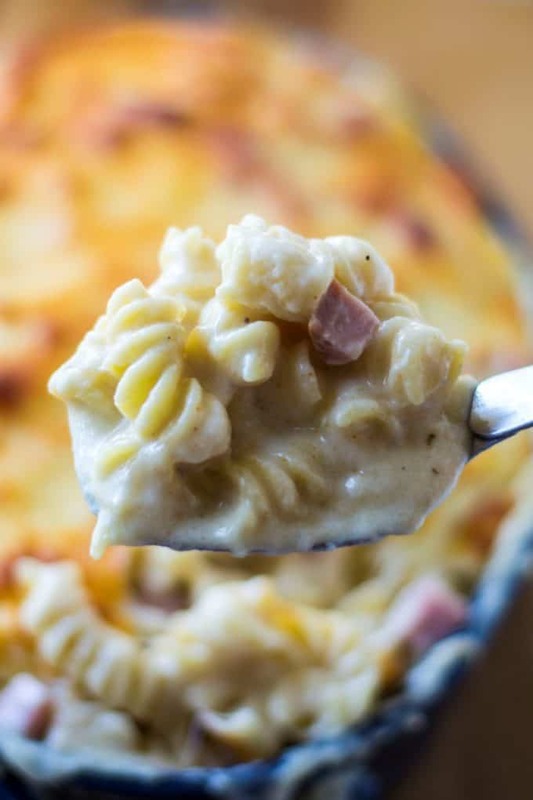 You can top your Baked Macaroni and Cheese with Ham any way you and your family like. I prefer to top my Baked Macaroni and Cheese with Ham with .. um .. more shredded cheese and bake it until the cheese is all crunchy. 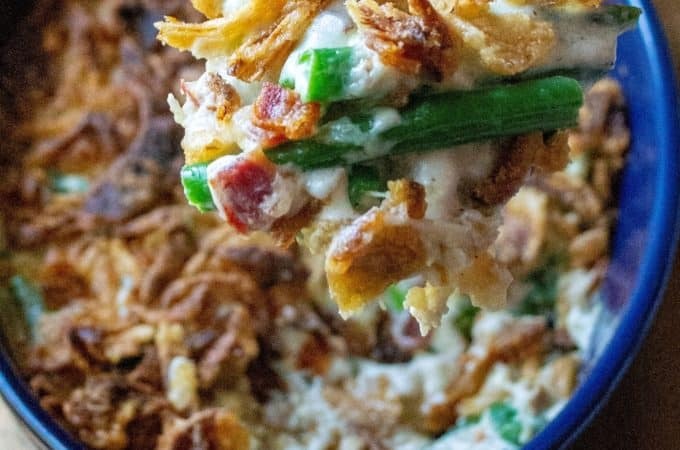 You can also top your macaroni and cheese with breadcrumbs mixed with a bit of butter, crumbled Cheez-its or Doritos and even crumbled bacon. CAN BAKED MACARONI AND CHEESE WITH HAM BE FROZEN? Yes! To freeze your Baked Macaroni and Cheese with Ham, transfer the macaroni and cheese to a buttered 9-by-13-inch freezer-to-oven baking dish. Cover the dish tightly with aluminum foil. Bake your macaroni and cheese still frozen and covered with foil at 350° for 1 hour. Remove foil and broil for 2-3 minutes for the crunchy brown cheese topping, if that is what you like. Macaroni and cheese with ham can be frozen for up to 2 months. HOW DO YOU MAKE BAKED MACARONI AND CHEESE WITH HAM? Easy! Preheat your oven to 350 degrees and bring a large pot of water to boil. Add in the pasta and cook for 3 minutes. Drain and set the pasta aside. In a large skillet, melt butter over medium-high heat. Once melted, add your flour and whisk to combine. Pour in your milk and while continuing to whisk, bring to a low boil. Add in your seasonings and continue to stir. Remove from the heat and whisk in your cheddar, swiss and Parmesan cheeses. Once all the cheese is melted, add in the pre-cooked ham and check for seasoning and flavor. Combine the pasta, ham and the cheese together and pour into a buttered 13 x 9 baking pan. 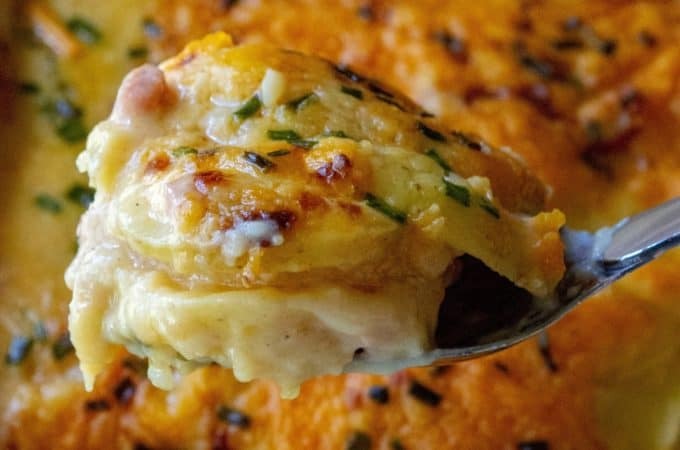 Sprinkle the Baked Macaroni and Cheese with Ham with more cheese and bake uncovered for 20 minutes. Remove from oven and let set for 5 minutes before serving. This Baked Macaroni and Cheese with Ham is a family favorite meal, it’s ready in JUST 30 minutes and is so easy to make that you will probably never make the blue box version ever again. I recommend using a good quality cheese and to choose one that is in block form. The pre-shredded bags are convenient but they seem to produce a lot of grease. The only pre-shredded cheese I have found that melts nicely and doesn’t get too greasy is Sargento. Food is fun .. feel free to change up the cheese choice if you have a better preference. Looking for more easy pasta dishes? Try my Ground Beef Stroganoff, my Creamy Macaroni and Cheese or my Tuscan Chicken Pasta. Have you made this recipe yet? Your feedback, ratings and comments mean the world to me and help ME write recipes better recipes for YOU! Preheat your oven to 375 degrees and bring a large pot of salted water to boil. Add in the pasta and cook for 3 minutes. Drain and set the pasta aside. While your pasta is cooking, melt butter in a large saucepan over medium-high heat. 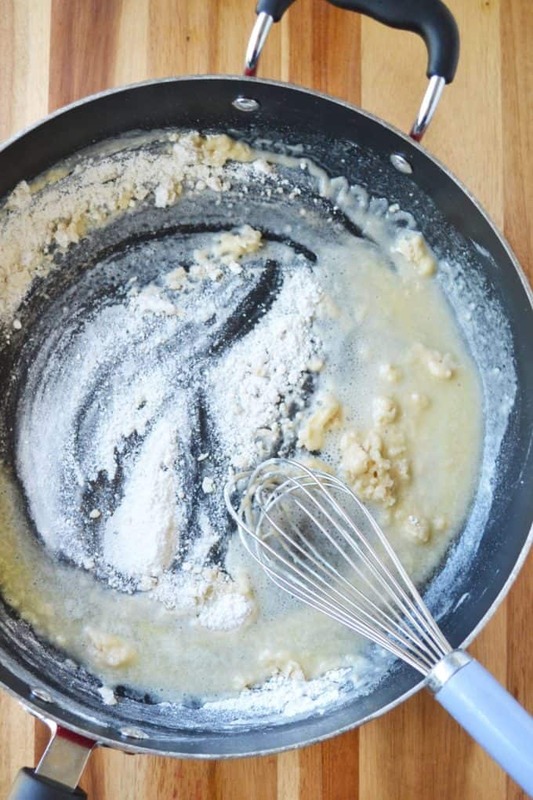 Once melted, add your flour and whisk to combine. Pour in your milk and while continuing to whisk, bring to a low boil. Add in your seasonings and continue to stir. Remove from the heat and whisk in your cheddar, swiss and Parmesan cheeses. 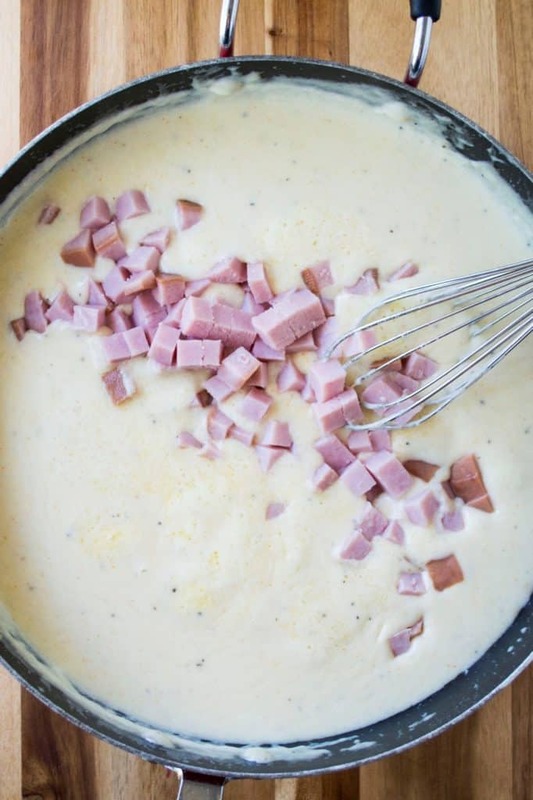 Whisk to combine and once all the cheese is melted, add the pre-cooked ham and check for seasoning and flavor. Combine the pasta, ham and the cheese and pour into a buttered 13 x 9 baking pan. Remove from oven and let set for 5 minutes before serving. Looks delicious! How many does the 9×9 dish serve? This is a bowl of luxurious dinner. My family will surely love it. Planning to make it tonight. Thanks for sharing. I am with you on this one! The topping I would always choose is more cheese on top and broiled to a crispy goodness! This is pure comfort food! 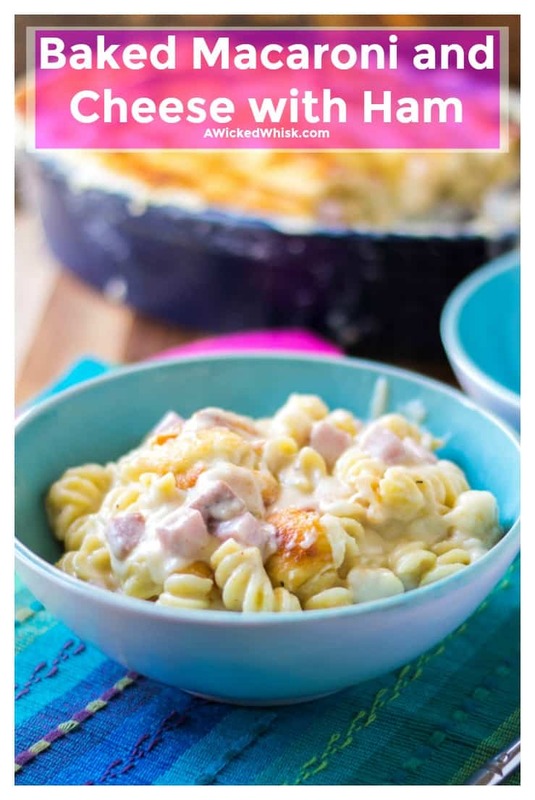 I love how cheesy and delicious your mac and cheese with ham looks! My family is a big fan of mac and cheese but I’ve never put ham in it! 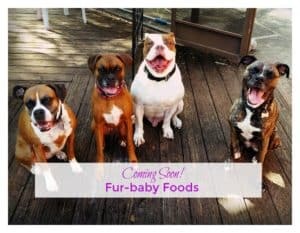 I can’t wait to serve them your delicious recipe! Mac and Cheese is a staple in our house. I love your variations, such a family pleaser! This is the perfect comfort food and easy meal! I like the use of the rotini pasta. With all the grooves it really holds the sauce. I had to laugh… I grew up on amazing homemade mac and cheese, but haven’t had it in decades because I have too much restraint for my own good! This looks so yummy and comforting (and tempting)! This Macaroni and cheese looks amazing! I think the addition of the ham really makes it into a delicious meal! I love mac and cheese and I love baked mac and cheese even more, but baked mac and cheese with ham? You have sold me! Can’t wait to make this dish. This sounds amazing! We love mac and cheese in our family. 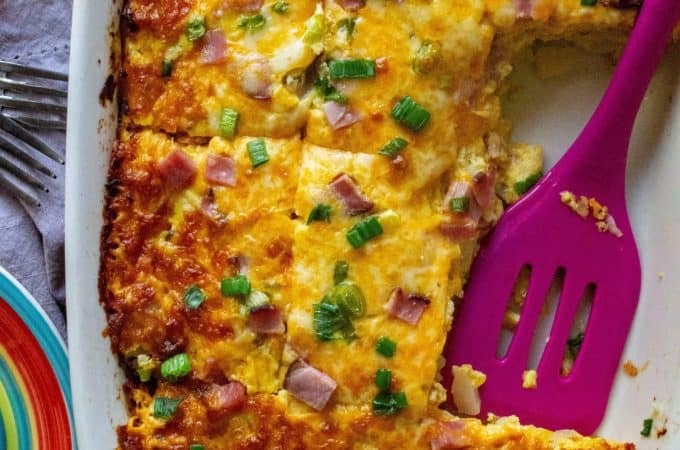 Love that it’s baked, perfect for a weeknight dinner! This looks like a perfect family meal! I love mac and cheese for dinner. And if I am lucky, leftovers for lunch the next day !